Lookingglass Theatre Company renders Antoine de Saint-Exupery's famous tale a visual and aural feast. I don't know why people persist in believing that The Little Prince is a children's book. To be fair, that is how it was intended by Antoine de Saint-Exupery, who wrote it in 1942. And it looks like a children's book: large type, lots of pictures. The title character is a child. On the other hand, I don't know any children who actually like the book. The copy my daughter was given six years ago, when she was in first grade, remains pristine, opened only once, when I tried reading it to her at bedtime and was ordered—in the same commanding manner the Little Prince himself displays—to find something else. A worldwide best seller since its publication in 1943, the book remains very much a thing that adults give to children, rather than something many children would choose themselves. It's really a book for adults. The protagonist is not the young prince but rather the middle-aged Aviator who narrates the tale. His entwined problems—one psychological (his artistic talent was thwarted as a child), the other practical (he's crash-landed in the middle of the Sahara and can't get his plane to fly)—are the central ones in the story. And the most charming elements of the book are the ones most likely to entertain a grown-up reader: Saint-Exupery's satiric jabs at adult life, his intentionally naive watercolor illustrations, and his Rousseau-inspired romantic messages about the superiority of feelings over intellect, the corruption of civilization, and the pure wisdom of children. The book is less an adventure than an allegory, in the spirit of Dante's Divine Comedy and Bunyan's Pilgrim's Progress, in which we meet a character at an especially low moment in his life and then follow his spiritual journey to redemption and re-enchantment. The fact that the book is so appealing to adults may be why there have been so many attempts to adapt it to the stage and screen over the years—Stanley Donen directed a movie musical in 1974; Hugh Wheeler, Don Black, and John Barry attempted a Broadway version in 1981—and why the attempts often feel so leaden. The version playing at Lookingglass Theatre Company is Rick Cummins and John Scoullar's 2000 adaptation, though director David Catlin and his talented ensemble have added lots of trademark Lookingglass touches to transform this play into an aesthetic experience—aurally and visually—worth taking the kids to during the holidays. 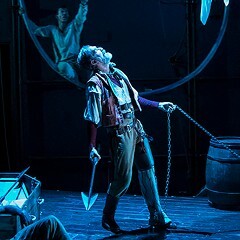 Like the best Lookingglass productions, this one is a dazzling spectacle, with elements borrowed from an array of sources: fashion photography, steampunk design, the circus arts. The show is packed with delightful dance numbers and carefully choreographed acrobatics (by Sylvia Hernandez-DeStasi), ear-pleasing sound design (Rick Sims), and glorious, constantly surprising set pieces (Courtney O'Neill). The principal set looks at once like the sand dunes of the Sahara and an unrolled piece of paper (on which the navigator re-creates the drawings he made to please the demanding Little Prince). Performances range from very good to outstanding. Ian Barford doesn't seem quite melancholy enough to bring out all the pathos and depth in Saint-Exupery's wounded narrator. Amelia Hefferon, both precocious and annoyingly chipper, makes a very believable Little Prince, and Louise Lamson, as the Rose who teaches the Little Prince the pain of heartache, is charming. But it's Kareem Bandealy who steals the show, as the satanic Snake who ultimately takes the Little Prince from the Aviator—and this world. In the end, though, the production flags just where the book does—during the tiresome last quarter, when Saint-Exupery packs in all his messages: "One sees clearly only with the heart," "Anything essential is invisible to the eyes," "Only the children know what they are looking for." It was during this part of the show that I became aware of the restless children around me. One wouldn't stop crying. Another couldn't stop coughing. Both behaviors I rarely see in children's theater. I was reminded of the fundamental contradiction of The Little Prince, which is that it valorizes both childhood and children—but not enough to actually entertain them. Correction: This has been updated to reflect that it's Louise Lamson, not Lauren Hirte, who plays the role of the Rose. 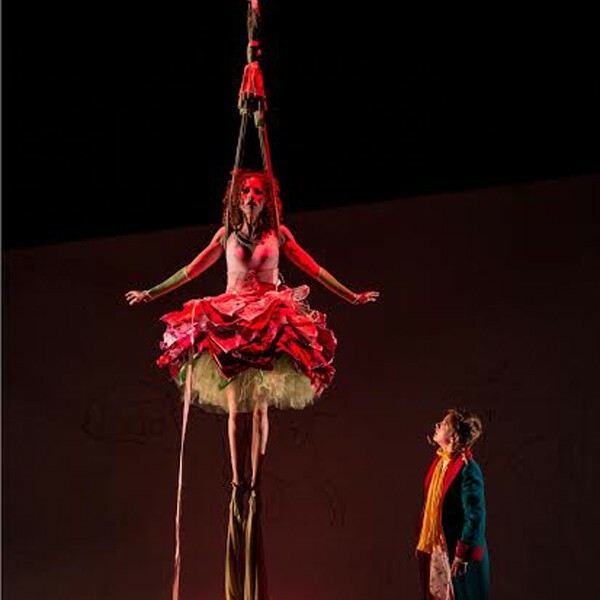 David Catlin’s dazzling aerial-acrobatic production returns.